Two news reports from the Manila Times last month about the ugly result of continuing business bureaucracies and heavy political intervention in the mining sector. It said any tightening of environmental regulations in the Philippines will have limited effect on actual production from the country, despite acting as a deterrent to potential new investment. Nickel ore output growth seen averaging 2.4% in 2017-2021. The second paragraph is an assurance that the existing local and foreign players are digging up and continue their business. It’s the potential players that are being discouraged. In a disclosure to the Philippine Stock Exchange (PSE), DMCI said 980 jobs were cut as of March 31, 2017, which translates to 240 left from the original count of 1,220 personnel. This does not include the thousands of subcontracted and seasonal workers hired during production ramp up. 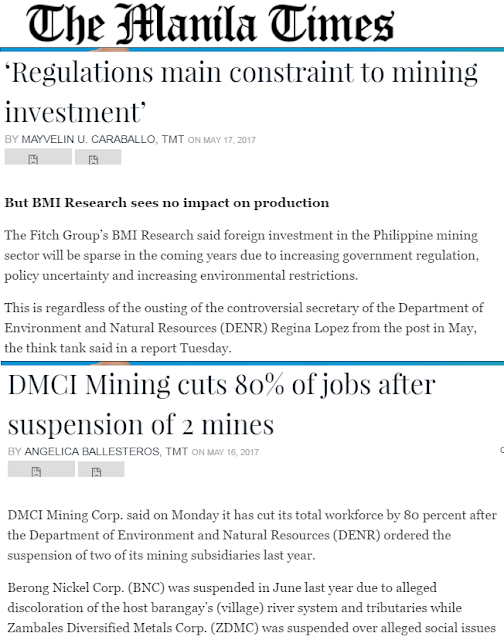 CA-rejected Gina Lopez did not and does not care about these job losses in the sector. One clear problem when one-track-minded zealots and activists are irresponsibly given high government positions. I revisited these two reports from Manila Standard. 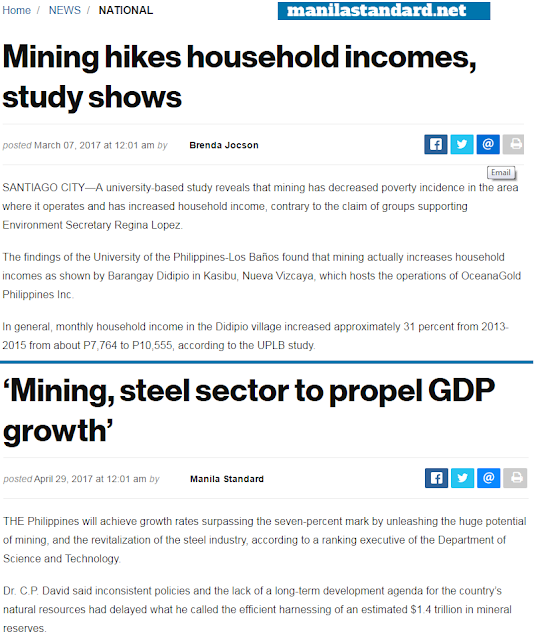 The UPLB study pointed out that the major change in the economy of Didipio village was due to the presence of OceanaGold in the village. Peviously, Didipio is an agricultural settlement and that farming was the primary source of household income. David is the DoST executive director of the Philippine Council for Industry, Energy and Emerging Technology Research and Development (DoST-PCIEERD), and concurrently, Stratbase ADR Institute (ADRi) trustee. “Hence we see the urgent need to partner with the mining industry in a series of research projects to develop a long-term national road map that will integrate the development of mining, steel and other downstream industries,” he said. Nice two articles. Mining-rich areas tend to be marginal and inappropriate for high-value agriculture or forestry because of the poor soil quality. By harvesting the minerals and metal ores, greater value and income for workers and staff, directly or indirectly employed by a mining firm, can be enjoyed and optimized.